Korean pop culture is getting an increasing amount of attention in the young French scene. To develop this interest into more diverse forms of Korean culture, the Korean cultural community in France, Kachi (together) to Korea, hosted Kachi’s Week. This cultural event, themed on K-drama, movies, K-pop, cuisine, travel and pansori with a Korean travel photo exhibit, was attended by 150 young French teens who were eager to learn more about Korean culture. 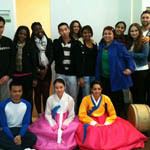 Korean cultural community in Australia, UNSW Kpop Society, hosted a dance workshop. Young Australians who are interested in K-pop gathered together to learn K-pop dances and share the latest K-pop news. Here, they are earnestly learning the dance moves to some ten K-pop songs.